While Facebook is the world’s top social network, it hasn’t really caught on everywhere. While many folks believe that anyone and everyone has a Facebook account worldwide, that just isn’t the case, especial if you are talking about Japan. While Facebook captivates and enthralls the rest of the world, Japanese people aren’t quite as interested. They seem to be keen on Twitter and in love with Mixi. With over 10 million members, the site focuses on “community entertainment.” It discourages using the site for dating, but it is supposed to help people meet others with common interests. 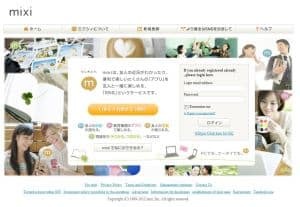 The site is also not open to everyone; people are supposed to invite your friends to join and a valid Japanese cellular telephone number is necessary to become a member. This network is pretty exclusive, but that seems to make Mixi all the more exciting. Is it worth all the commotion and hubbub? Mixi isn’t like the other social media networks, and that stretches beyond the exclusivity. An intuitive social media experience, users do have profiles where information such as their friend’s blog posts are displayed. The site is quick and responsive. This is mainly due to the fact that users are unable to edit and customize their profile pages. The standard layouts make the site more efficient. This does strip profiles of some of the member’s individuality, but showing your identity and uniqueness doesn’t seem to be what this site is about, as most profile pictures are of celebrities, pets or anyone but the person whose account it is. Mixi features a lot of sharing, however. Blog posts, music and even reviews of books, games and more pop up on this site. If a user wants to, they are able to share quite a bit of themselves in their cookie cutter profile. It seems that Mixi indeed aims to connect people who either know each other already or who share common interests. Users are limited at 1,000 friends so that they cannot collect people in the way that many on other social networks do and have done. Celebrities are able to have more than 1,000 friends, however. It is hard to give any real opinion on Mixi. The social network is so very different from what many of us in the West are used to, but it is very much the same concurrently. Mixi seems to reflect the Japanese culturally. The exclusivity of the network is one example for this. Due to this cultural divide, it is truly difficult to make any decisions about Mixi, aside from reporting on it. 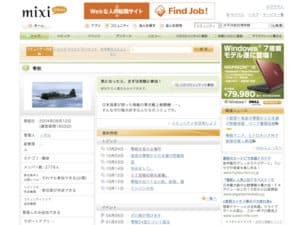 It seems to be doing well, as it still is one of Japan’s top sites. It is popular enough that many users report “Mixi Fatigue,” which leads to them withdrawing from the site before abandoning it altogether. Even if the site and its appeal is hard to understand for some, any site that has this sort of hold on so many members must be doing something right. Frederic is a social network expert, interested in video clips, music, mac security and new technologies. Next story Does Social Media Enhance Activism? Previous story Can Social Media Help Real Estate Business?